I am in full on cookie baking mode. I just put about 200 Starry Starry Night cookies into the freezer, waiting to be baked tomorrow, and I decided to sit and think about what other kind of cookie I could make. 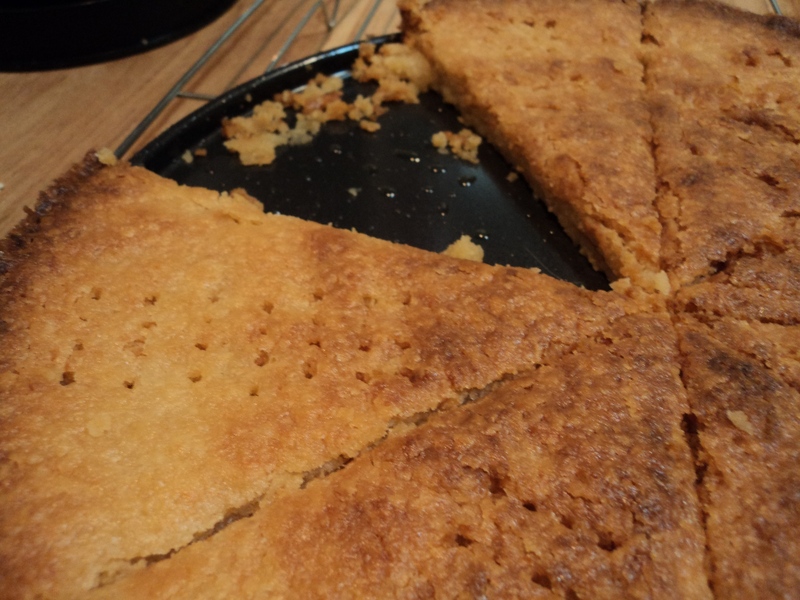 I love shortbread – full, rich, simple and classic, but I wanted to give it a twist. As I looked in my store cupboard, I realised I had about a kilogram of Valrhona white chocolate waiting to be made into something fabulous. I wanted to make white chocolate chip cookies, and I still may do that, but I wondered if there was a way to get white chocolate into a shortbread without making a shortbread with white chocolate chips. I wanted the white chocolate to be in every bite, to permeate the shortbread – to live in its essence 🙂 So I thought about it some more, and looked at the ingredients list – pretty simple, really. Butter, sugar, flour. Vanilla for additional flavour if needed, and a touch of salt. Thats it. Well, I thought, if I were to add white chocolate, I could bring the sugar content down. But how to add the chocolate without melting it? Melting the chocolate and adding it to shortbread would, I thought, mess with the essential crumby-ness of this classic biscuit. It would make a nice cookie, but it wasnt what I wanted. I was still thinking about the sugar though, and then it came to me… Could I somehow crumb the white chocolate so that it was mixed in with the flour? I could blitz with my immersion blender – and lo! It worked! Place white chocolate, flour and salt in a large bowl. Using your hands, mix together until all the white chocolate is completely covered in flour. This is important for the next step, so please dont skip it! If you are using a food processor or blender, place the flour chocolate mixture into the machine, and pulse lightly until the white chocolate has crumbed and completely integrated into the flour. If you are using an immersion blender, as I did, place the blender into the flour chocolate mixture, and pulse quickly. Move the bowl around, until all the chocolate has been incorporated into the flour. Set aside in the refrigerator while you prepare the butter mixture. In a stand mixture, or using a hand held mixer, cream the butter until it is light and fluffy. This usually takes about a minute or two. Add the light brown sugar and cream until it is incorporated into the butter. Add vanilla and mix again. Remove the flour mixture from the fridge, and add to the butter mixture, adding it in a few batches. The dough will come together quickly. Butter a spring form pan or a tart pan (about 9 – 10 inches across), and place the dough in the centre. Using your hands, quickly push the dough so that it covers the entire bottom of the pan. Score wedges with a sharp knife (I cut it into 8 pizza wedges – you could do it however you wish), and poke holes in it with the tines of a fork. Refrigerate the prepared dough for at least an hour, or overnight. Once youre ready to bake the shortbread, preheat the oven to 175C (350F). Bake the shortbread for about 25 – 35 minutes. Check after about 15 minutes, and if its browning too fast, cover with a little aluminum foil to prevent it from burning. After about 25 minutes check again – it should be crumbly and firm to the touch. Cool, in the pan, on a rack for about ten minutes. Re-score and re-hole if you feel the shortbread needs it! After about ten minutes, cut the shortbread through with an offset spatula or sharp knife, and allow to cool for a further ten to fifteen minutes. Serve immediately and enjoy! If you have any leftover, cover and refrigerate for up to 2 weeks.